Winter safety tips for seniors. Seniors' bodies don't naturally produce as much heat as other people's, which combined with a weakened immune system makes them more susceptible to everything from hypothermia to pneumonia to basic colds. Make sure your client is properly prepared for the cold weather every time they leave the house with appropriate outerwear like a coat, gloves or mittens, a scarf and a hat. Falls are a major risk for seniors in any circumstances, but snow and ice make the likelihood of falling even higher. 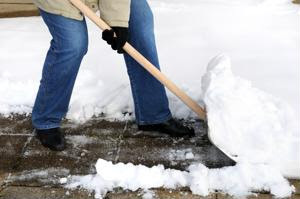 Be sure that your client's walk is completely shoveled and salted before they go outside to help keep them from slipping, and physically assist them in slippery areas by holding onto their arm or allowing them to use you for support. With bad winter weather comes the chance of power outages, so make sure your client is fully prepared just in case an outage happens. Have them stock up on canned foods and water, and keep plenty of blankets in rooms around the house, so they can stay warm without a heater.